GOOD MORNING my sweet friends & welcome to day 4 of our 5 days of Christmas! Okay, for today, I had a few emails stating that a few of you wanted to see some EASY cards that you can mass produce QUICKLY! Sooo, I came up w/this EASY card! When I think of "Easy", the FIRST thing that comes to mind is "watercoloring!" You can see in my video below EXACTLY how I created my card from beginning to end! I actually LOVE how they came out! I will be making 20 more of these this weekend & I think they will be done in no time at all! Since I have these ADORABLE Starbuck's gift cards, I thought it would look PERFECT in my "Tag Gift Card Pocket Die", but I cut it out using clear acetate just so you can appreciate & SEE the CUTENESS of this gift card! Also, I left room at the top for you can include a message on the inside as well! I love the card & love the watercolor set giveaway. Super cute ! Beautiful Christmas card, thanks for sharing! Good Morning Miss Emma and WOW & OMG What gorgeous cards!! I just really love watching you water color and then when you put your silver tree on it WOW how beautiful. I also loved how you made a spine to your card thanks for the cool idea and an acetate pocket gosh so many clever and creative ideas in one card loved it all.....and wow what a giveaway thanks for the chance. Have a T-RIFFIC Thursday!! YOU totally ROCK!! What a great card I love it ! Thank You Miss Emma for all that you do for us. I like the water color background for your card. Beautiful card. I love the watercoloring. Love the water colour...fab Emma! Your card is adorable, Emma! Great idea to make the pocket acetate to show off that adorable gift card! Love this water color card. Have been wanting to try water color. Very cute with the tree. Never would have thought to make that envie out of acetate. Brilliant again! I have been collecting the awesome cards that SB has out this season. When they run out I will have my stash to load up! Great job by the DT once again. Your water coloring is amazing and then to top it off with that gorgeous tree....fabulous!!! I love the darling gift pocket die to hold the gift card:) So cute Emma! Great projects this week!!! Oh my word Emma ~ I LOVE this card! I LOVE the water coloring ~ I have YET to try it but I LOVE how you could mass produce these very quickly and yet have them turn out so BEAUTIFUL!! Again I want to win this giveaway! UGH! LOL This team is seriously AMAZING!! Wonderful inspiration!! Love the watercolor swipe! Lovely watercolor background for the tree. Amazing work again today by your talented DT. Weeeee, another fabulous day of projects... I am enjoying all of the sweet adorable inspiration from your entire team! Fabulous water color Cards... I have seen this technique before and loved it but you just showed me how very simple and fun it really is to do. Thanks for the awesome giveaway! Looking forward to tomorrows awesomeness! Such a very pretty card and nice gift card and gift card holder!!! Cute card - love the water coloring. The watercolor background is Gorgeous!! Adorable!! Love the water color behind the tree. Fabulous!!! Love the splashes of color. This is another technique I need to use more often. Emma, you never seize to amaze me! You are always creating amazing things! LOVE this watercolor! I haven't done much so I really learned a lot from your video! Thank you for your inspiration! What a great prize! I like your watercolor card. So pretty and very fast and easy. This is so pretty...and I love the clear pocked for that awesome gift card holder!!! Amazing! Love your beautiful card!! The hop is full of so much inspiration....LOVE it!!!!! Miss Emma, I always love seeing your watercolor cards! That red and green just pops!! Hugs!! cool cards an great ideas!!! Beautiful card!! Your watercoloring is always amazing!! Thanks for sharing!! I like how bright your watercolor turned out...perfect background for the pretty silver tree. The paints do look creamy and easy to use. That is one special gift card...I like that it will be an ornament. Beautiful job. The design team also had great projects today. They are awesome! Quick cards are definitely the way to go at the moment! Fab watercolour design! What a gorgeous card Emma!!! LOVE the watercolor look!!!! Love the watercolor background, Emma. I've never thought of using the clear acetate for the giftcard pocket. That's an excellent idea. pretty items to look at! your team did another day of super cute projects!! Lovely water color card, very creative! 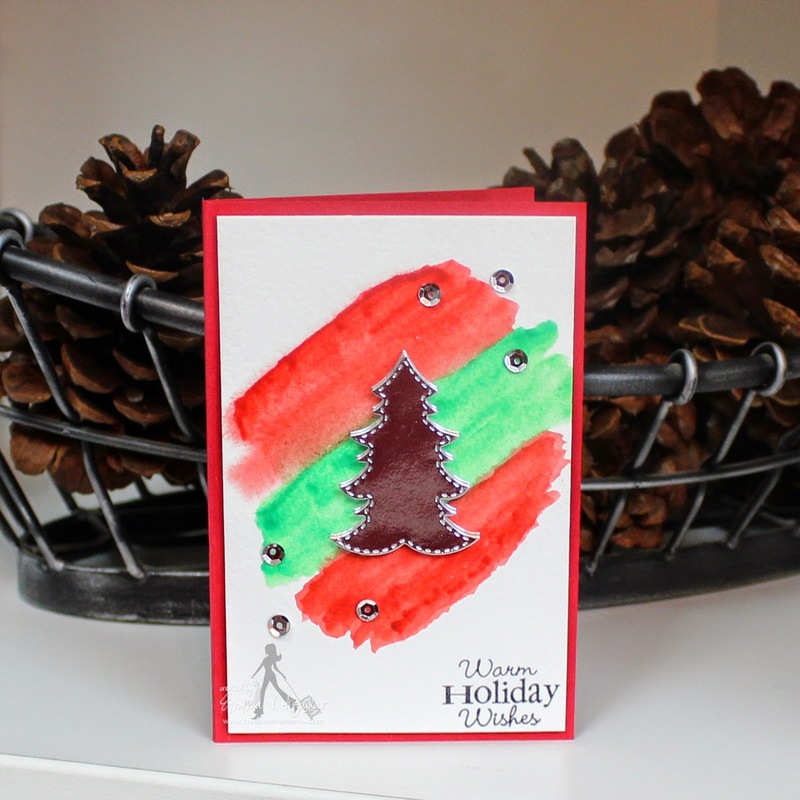 Great watercolor card and love you sparkly tree! What a cute idea!! 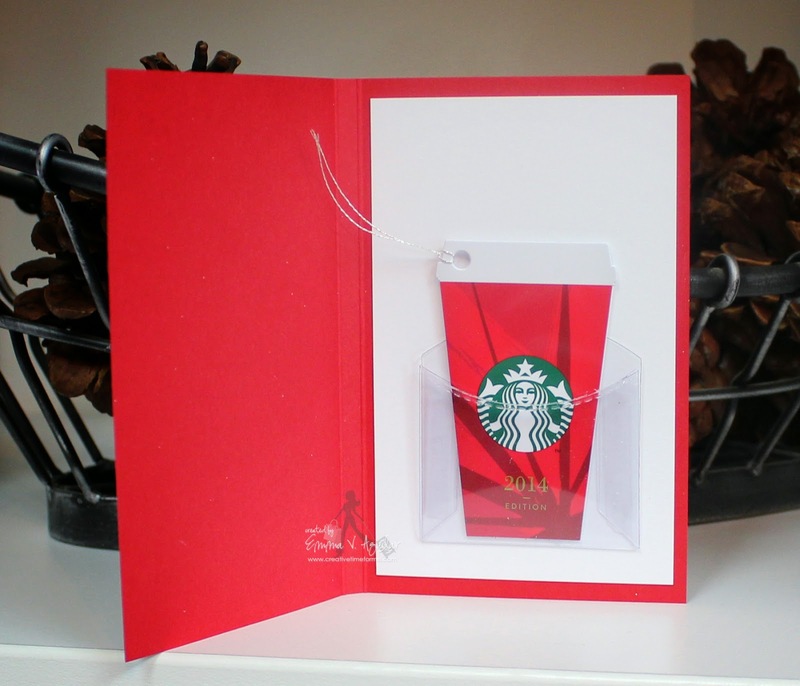 and the clear gift envelope is perfect for the so cute Starbucks gift card!